Scaling in and out of trades can be a real game changer when it comes to consistently profitable trading. 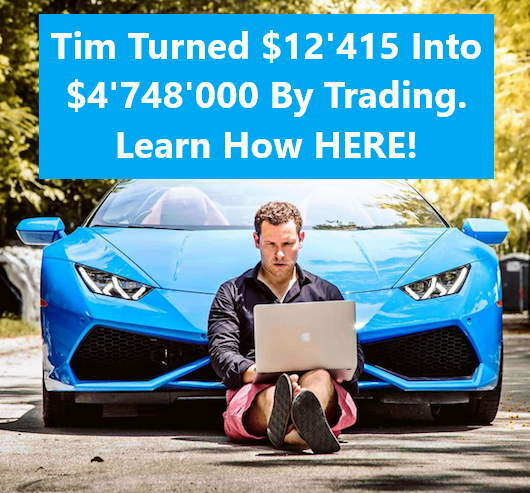 No matter if you trade stocks, options, futures, forex or whatever, if you are currently entering and exiting your trades in one step, you are making trading much harder for yourself. In this article, you won’t only learn what scaling in and out of trades is. You will also learn why and how you should scale in to a trade instead of opening it in one go. First of all, let me present what scaling in and out of trades is. Scaling in and out of trades is also often referred to as averaging in and out trades. The main difference between a ‘normal’ trade entry and a scaling entry is that when scaling, you build your position in multiple steps. Let’s say, you want to open a 1000 share long position in stock XYZ. The most straightforward way to do this is to send a 1000 share buy order. However, what you could do instead is split up the opening process into multiple parts. For instance, buy 500 shares twice or 200 shares 5 times, 100 shares 10 times etc… If you would do this, you would scale in to a trade. You’re probably asking yourself why this is better than just opening the entire position in one step. So let me present you the advantages of scaling in and out of trades next. Once again, you want to buy 1000 shares of XYZ which is trading at $25. If you scale into the position, you could split it up into 3 steps (400, 400 and 200 shares). Your first order is a buy order for 400 shares. Now let’s say XYZ’s price immediately goes against you and drops down to $24 which is your max risk level. Therefore, you exit the position and cut the loss. Your total loss is $400 (400 * $1). If you would have opened that position with the full 1000 shares right away, that loss would have been $1000 instead of $400 (1000 * $1). In addition to smaller losses, scaling in and out of trades, often also leads to bigger profits. One reason for this is that when scaling out of positions, you give your trades the opportunity to make (more) money. You bought 100 shares of stock ABC at $150 and ABC’s current price is $155. If you would close the entire position at once right away, your total profit (without commissions) would be $500 (100 * $5). However, let’s say you only sell half of the position at $155 and hold on to the remanding 50 shares a little longer. Now ABC’s price continues to rise to $158 at which you sell the last 50 shares. Now the total profit would be $700 (50 * $5 + 50 * $9) which is $200 more than before. All of the advantages that I am going to present next are related to the two just-mentioned ones as they lead to bigger profits and smaller losses. In other words, they lead to better, more consistently profitable trading results. One more major advantage of scaling in and out of trades is that it allows for imperfection. If you always open and close all your trades in one go, you have to be correct right away. If the position goes against you, you will likely take the entire position off to cut losses. This leaves little room for error. However, if you scale in to a trade, your first order will only be a fraction of the full position. So if that position goes against you, you have a much smaller position with much less risk than before. The same goes for when closing your positions. If you take off your entire position at once, you immediately eliminate the entire profit potential. But if you scale out of your position, you give your positions more time to work as you only lock in the loss or profit of a small part of your overall position. Patience is probably the most straightforward. A common problem amongst traders is that as soon as they see a profit, they begin wanting to lock in the profits so that they can’t turn into losses. The problem with this is that this often leads to people leaving a lot of money on the table which leads to overall smaller profits. This can often be a reason for the lack of profitability. The way that scaling out of trades helps against this is that it allows you to lock in profits without eliminating the entire remaining profit potential. When taking partial profits, you still give your positions the chance to make more money. Furthermore, scaling helps with your confidence in your own trades because you slowly build your position instead of putting on the entire thing at once. This means that you should only be in a position with the full intended size if it already has proven itself. Otherwise, you should only be in the trade with a small position. Would your emotions impact your decision making when you trade a $20 stock with 1 share? Probably not, because 1 share is a tiny position. The smaller your position, the less emotional you usually are. 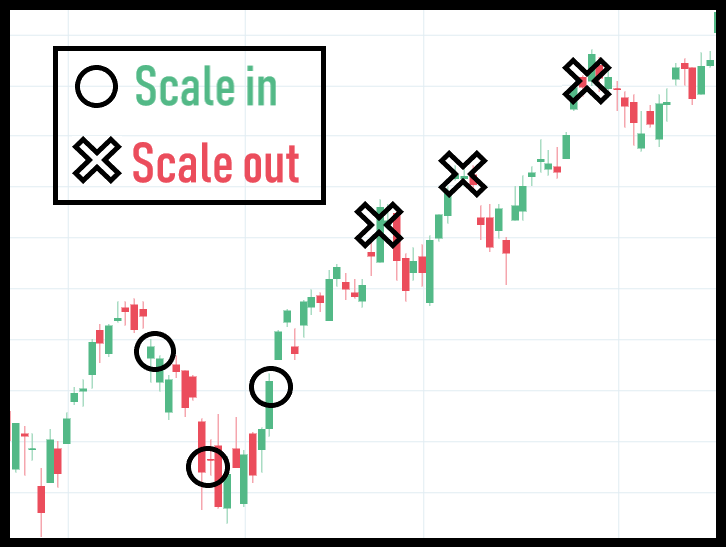 Scaling in and out of trades leads to you, on average, being in your trades with full size less and for shorter periods than if you wouldn’t scale in to a trade. This alone, leads to more rational and mechanical trading. ABC is trading at $10.5 and you want to buy 1000 shares. If you just buy the 1000 shares in one go, your average entry price will be $10.5. However, if you begin by buying 500 shares at $10.5 and then ABC’s price drops to $10.0 which is where you buy 500 shares more, your new average entry price will be $10.25 ((500 * $10.5 + 500 * $10.0) / 1000). This is a significantly better breakeven-point than before. Summed up, scaling in and out of trades allows you to be less perfect and more flexible with your trading. The main disadvantage of scaling in and out of trades is commission costs. Depending on your broker and on your commission structure, scaling in and out of trades can be more expensive than opening and closing everything in one go. If you, for instance, have a flat-fee that you have to pay to open a trade, scaling into trades will cost more than not scaling into trades. Due to commissions, scaling in and out of trades is especially useful in larger accounts where commissions don’t play a big role. With that being said, I still think that scaling in and out of trades can be beneficial for small accounts. As you can see, tastyworks’ commissions are very competitive. Due to tastyworks’ commission structure, it is very possible to, at least, scale out of your trades even if you only have a very small account. Tastyworks does not charge any commissions when you close your positions. Therefore, it does not affect your trading cost whether you close your positions in one, two, three or even more orders. Proper risk management: Just because you are scaling in and out of trades, does not mean that you shouldn’t actively manage your risk. Regardless of your entry and exit style, you should always have a plan and define your max risk before you open a trade. Don’t just add and add to losing positions: Adding to your position after it has already gone against you allows you to move your average entry price closer to the current price. But this does not mean that you should just continue to add and add to a position that has clearly already gone too far against you. Always remember that for each time you increase your position size, you are increasing your risk as well! Remember to take profits: Scaling out of trades allows you to be more patient with your positions. With that being said, it is still important to not be overpatient. Let your position prove itself: Before adding to a position, let it prove itself. Everything should be going according to your anticipated plan. If things aren’t going as expected, do not increase your position size and risk! Scaling in and/or out of trades can be very beneficial to your trading. Nevertheless, it is important to understand that scaling in and out of trades won’t always lead to better results. There will be some trades where you might have had a better outcome if you wouldn’t have scaled. But this does not mean that you should never scale in to a trade. In my opinion, more often than not, scaling helps. Scaling in and/or out of trades just allows you to be less perfect and more flexible. However, if a certain trade would have been perfect (e.g. you bought at the low and sold at the high), scaling does not help. But let’s be honest, it is rare to execute a trade completely flawless. In other words, scaling is not for you if you are a perfect trader that always hits the tops and bottoms perfectly. For everyone else, I at least recommend trying to scale in and/or out of trades. A good beginning is to start by closing your positions in more than one step. This is especially useful if your broker is tastyworks because there are no commissions on closing orders at tastyworks. If you want to learn more about tastyworks, make sure to check out my tastyworks review. I must say that this article is very helpful and informative. 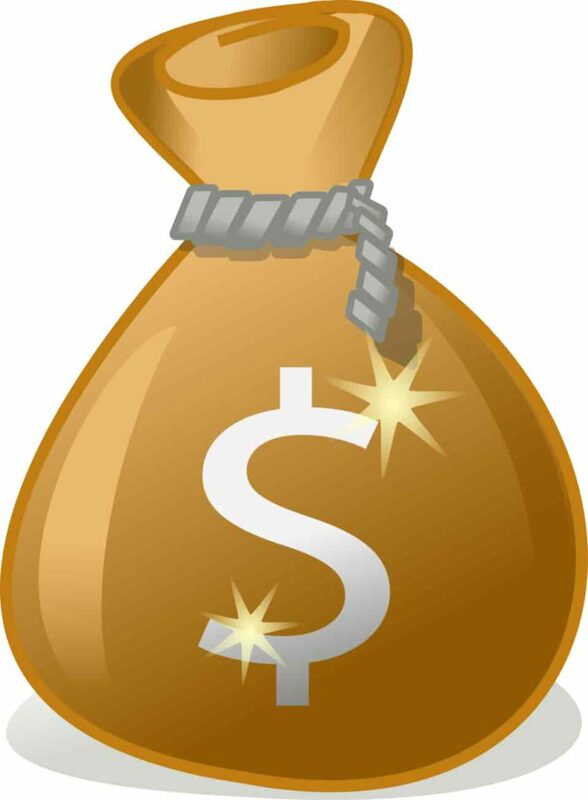 I like to trade and although it includes high risk, I think that it can be a good way to earn some extra cash online. I have not yet tried to scale in to a trade but it seems realistic to me, I will give it a try and I hope that you are right. Thanks for sharing. Thanks for commenting Daniel. I am glad that you liked this article. Wow this post was very eye opening for me. I’m the last when I bought stocks or something similar, I always bought the full amount then sold it all when I needed the money. Bieber the scaling in and out of trades as you mentioned in your post seems to have many benefits accociated with it. Have you tried doing this with crypto currency, or mainly just stocks and other stuff? I personally have never traded any cryptocurrencies, so no I have not used this on cryptocurrencies. But scaling in and out of trades works for almost anything. It doesn’t really matter if you are trading cryptocurrencies, stocks, options, futures, forex or something else. I can see why scaling in and out of trades would be a good thing rather than putting your money all in one trade at once. Each trade on the same stock will rise and fall but at different levels so you can set different stop losses is that that correct? I expect this strategy can work if the stock is bullish or bearish? Thank you for the comment, Darren. I wouldn’t necessarily recommend using different stop loss levels. Instead, I recommend having one max risk level at which you will definitely cut losses. While the stock approaches this level you slowly scale out of your position (depending on how the stock acts). And yes, that’s right. Scaling in and out of trades works regardless of the direction. Profitable traders turn to scaling into a position for a variety of reasons. 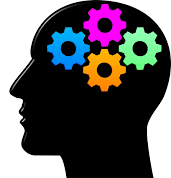 Some of the more advanced thinking postulates it’s a good idea in order to reduce the amount of slippage received when opening a large trade or to hide a large position that you don’t want others to know about, and the main reason why traders The most important and common reason why traders scale into a trade is to amplify their gains on a trade that has already begun which look like a promising move. You’re absolutely right! Thanks for the comment. This is really informative and educative. This is a must read for everyone into trading. This is really beneficial because I’m a newbie in trading and I have never thought of scaling in to a trade before and I think it will really be of great help. Thanks for sharing this post. I will share this post to my friends so they can see what is beneficial to them. Great to see that you found this article informative. I hope your friends will like it as well. So scaling in and out of trades helps you have smaller losses, bigger gains because you are scaling out and you have more room for error! I have done a bit of trading, I like the idea of trading but am not that great with risk so this all means a lot to me. The trading psychology is very important, fear and greed play such big parts in your decision making, if you have this under control you must be able to trade much better. Nest time I trade I will try to scale in and out technique because it sounds like a smart idea and process. Thanks for the tips! I am very happy to hear that you learned something new. Hopefully, this will help you with your future trades. Hello Louis,I would like to be able to make a trade using the techniques you described. I have once done business buying and selling different currencies. I find it interesting especially for beginners like me scaling in and out of trades. We could in this case reduce losses and improve our profits. What is the minimum capital that is required to start? Do they take a previous course as training? The minimum amount required to trade depends on what you want to trade and how you want to trade it. But generally, I recommend having at least $1500-$2000 in your account. Otherwise, your possibilities will be quite limited. And yes, I definitely recommend taking courses and educating yourself before risking any real money.